Whether you have a collection of antique clocks or a clock that is a treasured family heirloom handed down through the generations, there may be a time when you need antique clock parts to keep your timepiece running smoothly for many years to come. Although there are many antique clock collectors that do some, or all, of their own clock repairs, there are also many that have a professional clockmaker make any necessary repairs. If the antique clock is a common one, a clockmaker may have the parts needed for repair in his inventory. However, with the thousands of clocks, manufacturers and clock parts, it is more likely that the parts will have to be ordered from a supplier or distributor that specializes in parts for antique clocks. Even if you decide to have the repairs made by professional clockmaker, locating the needed parts yourself and bringing them with you to the clock repair shop is often a good way to reduce the cost of the clock repair. Whether you are making the clock repairs yourself or taking the repair parts to a clockmaker, you must first identify the clock and determine the parts that need to be replaced or repaired. Most collectors prefer to keep their antique clocks as legitimate as possible by using original parts rather than new reproduction parts. With the exception of rare antique clocks, most parts needed for repair or restoration of collectible antique clocks are available although they may be difficult to find. 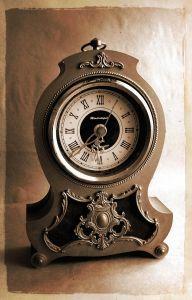 There are many websites that specialize in parts for antique clocks. 2-Clicks Antique Clocks provides an interesting assortment of reference books on antique clock parts, horological booksellers and clock identification and price guides.